The purpose of this chapter is to examine the influence of social progress orientation on entrepreneurial activity in an international analysis. Through a cross-sectional model with information from the Global Entrepreneurial activity Monitor, the Indices of Social Development, the World Values Survey, the Hofstede Centre and the United Nations Development Programme, this chapter finds that social progress orientation approached through voluntary spirit, survival versus self-expression values, power distance, and masculinity versus femininity explain entrepreneurship. More specifically, the main findings demonstrate that high voluntary spirit influences positively total entrepreneurial activity driven by innovation, whereas high voluntary spirit and low masculinity (femininity) affect positively the prevalence of entrepreneurial activity driven by opportunity over the entrepreneurial activity driven by necessity. This chapter may serve to keep advancing on the discussion about what social progress orientation means, and comprehending those factors that influence entrepreneurial activity in the light of institutional approach. Additionally, this chapter may serve to discuss policies to promote entrepreneurship in different contexts. Another version of this chapter has been published in Urbano, D., Aparicio, S., & Querol, V. (2016). Social progress orientation and innovative entrepreneurship: An international analysis. Journal of Evolutionary Economics, 26(5), 1033–1066. Alkire, S., & Santos, M. E. (2010). Acute multidimensional poverty: A new index for developing countries. Working paper No. 38. Oxford Poverty & Human Development Initiative (OPHI). http://www.ophi.org.uk/wp-content/uploads/ophi-wp38.pdf. Accessed 1 Apr 2014. Amorós, J. E., & Bosma, N. (2014). Global Entrepreneurship Monitor 2013 global report. Global Entrepreneurship Monitor. http://www.gemconsortium.org/docs/download/3106. Accessed 26 Sept 2014. Blanchflower, D. G. (2004). Self-employment: More may not be better. National Bureau of Economic Research. Working paper w10286. http://www.nber.org/papers/w10286. Accessed 1 Oct 2014. Foa, R. (2011). Indices of social development: Research applications. International Institute for Social Studies Working Paper Series. http://www.indsocdev.org. Accessed 2 Oct 2014. Foa, R., & Tanner, J. C. (2012). Methodology of the indices of social development. Institute for Social Studies Working Paper Series, Working paper 2012–4. http://www.indsocdev. Org. Accessed 1 Oct 2014. Hartog, C., Parker, S., van Stel, A., & Thurik, R. (2010). The two-way relationship between entrepreneurship and economic performance. Scales report H200822. http://core.ac.uk/download/pdf/6332576.pdf. Accessed 15 Sept 2014. Hunt, S., & Levie, J. (2002). Culture as a predictor of entrepreneurial activity. In Babson College, Babson Kauffman Entrepreneurial activity Research Conference (BKERC) (2002–2006). http://papers.ssrn.com/sol3/papers.cfm?abstract_id=1748691. Accessed 30 Sept 2014. Naudé, W. A., Amorós, J. E., & Cristi, M. (2013). “Romanticizing penniless entrepreneurs?” The relationship between start-ups and human wellbeing across countries. IZA Discussion Paper 7547. http://www.econstor.eu/handle/10419/80527. Accessed 15 Apr 2014. Porter, M. E. (2013). Social Progress Index 2013. Social Progress Imperative. http://www.prueba04.info/wpcontent/uploads/2009/01/SocialProgressIndex2013.pdf. Accessed 30 June 2014. Urbano, D., Aparicio, S., & Audretsch, D. (2018). 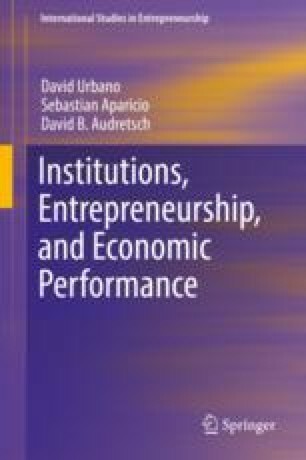 Twenty-five years of research on institutions, entrepreneurship, and economic growth: What has been learned? Small Business Economics. In Press, https://doi.org/10.1007/s11187-018-0038-0. Webbink, E. (2012). Inclusion of Minorities. The Indices of Social Development. http://www.indsocdev.org/resources/ISD%20Inclusion%20of%20Minorities.pdf. Accessed 5 June 2014.